In addition to my favorite varieties of radicchio and escarole I grew another chicory this year, a sugarloaf type from Fedco called Pan di Zucchero. It’s wonderful and definitely my new favorite chicory. Growth habit, hardiness and flavor are all reasons I wish I’d grown a larger crop of this delicious bitter green. Next year I will and I’ll also try two other sugarloaf varieties, Virtus, offered by Johnny’s and Borca offered by Adaptive Seeds. 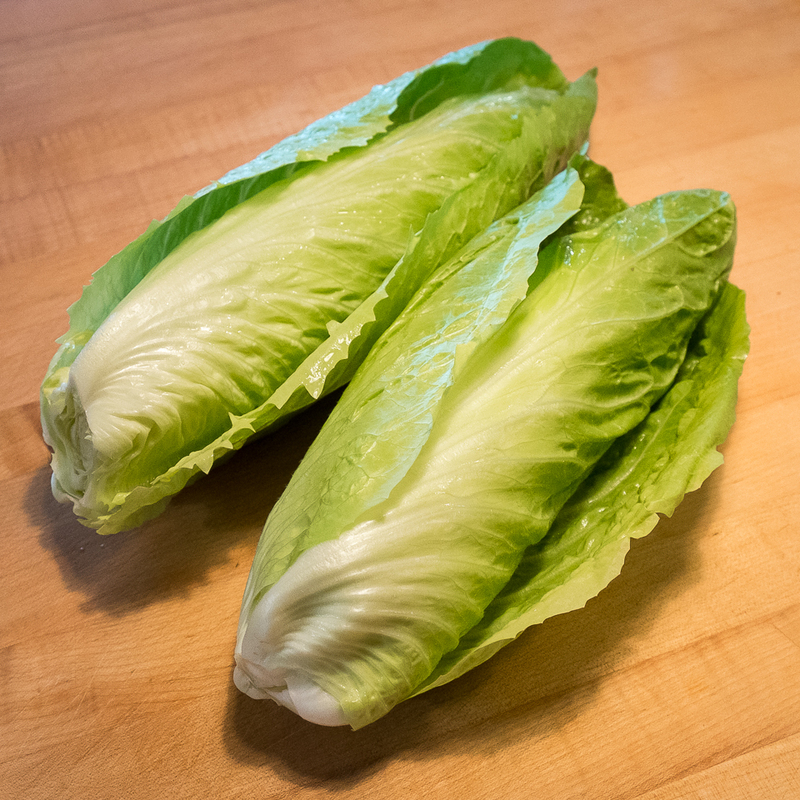 As the Fedco description suggests, sugarloaf chicory looks like “romaine lettuce crossed with napa cabbage.” Unlike escaroles and curly endives, which grow outward in great sprawling rosettes, sugarloaf chicories grow upright to about a foot tall, their leaves wrapping tightly around each other to form dense loaves. Like the leaves of escaroles and chicories, the leaves of sugarloaf chicories are green at the edges and creamy yellow near the center. One of the reasons I wanted to try this vertical chicory is that I’ve really liked the elongated, upright Treviso radicchios like Fiero. 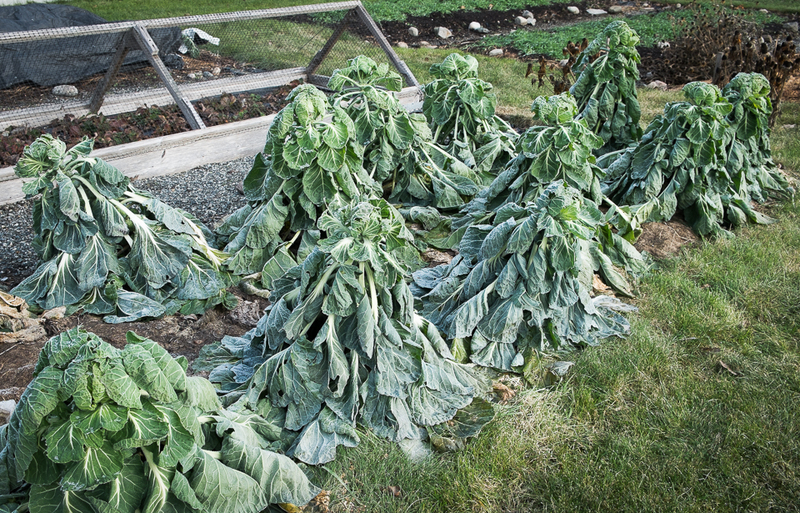 In a winter garden, this upright, tightly wrapped habit makes the individual plants easier to mulch and less likely to rot. 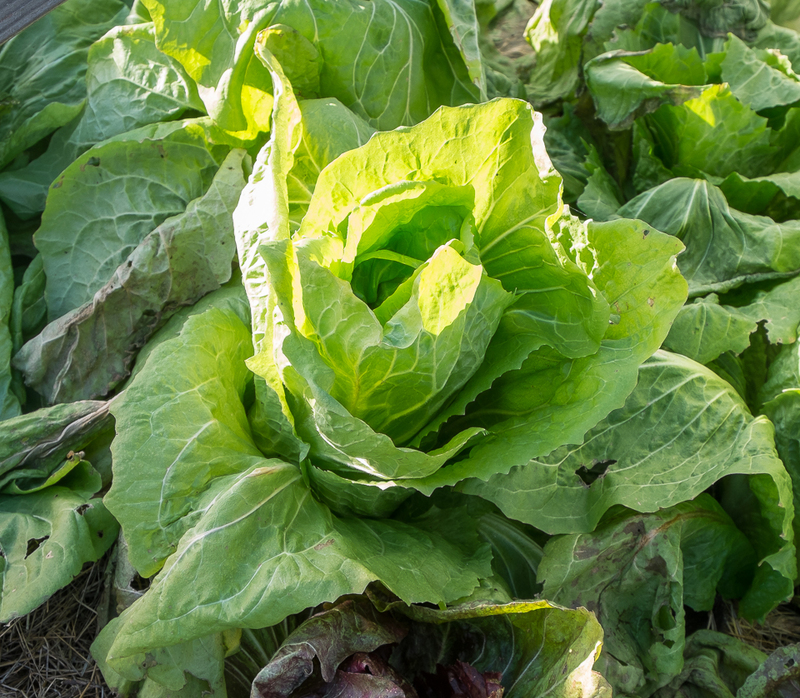 Delicious as they are, the loose, open leaves of escarole and curly endive sit right on top of mulch and over time begin to rot even when I tie them up. 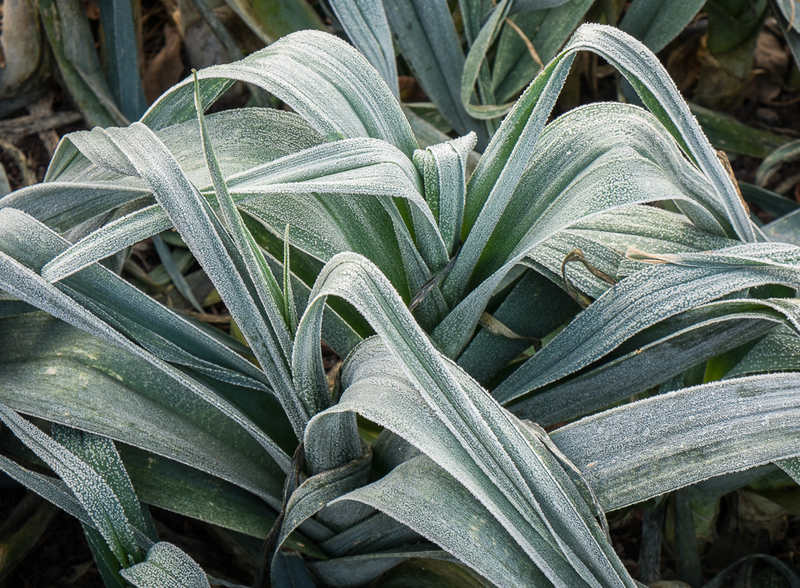 The upright habit and dense inner leaves of Treviso and Sugarloaf also help them withstand temperatures in the teens and low twenties. After our two recent blasts of deep cold, I was very happy to find that even though the outermost leaves were a bit battered both the Treviso and the Sugarloaf inner leaves were as delicious as they were before the freeze. I’ve read about a gardener in Vermont who covers her Sugarloaf chicory up the sides and almost over the top with a mulch of dry leaves. I think I will try that the next time really cold weather is in our forecast. Though I cover these greens in a low plastic tunnel to protect them from rain, I want to do anything else I can to keep this tasty chicory available for the kitchen. 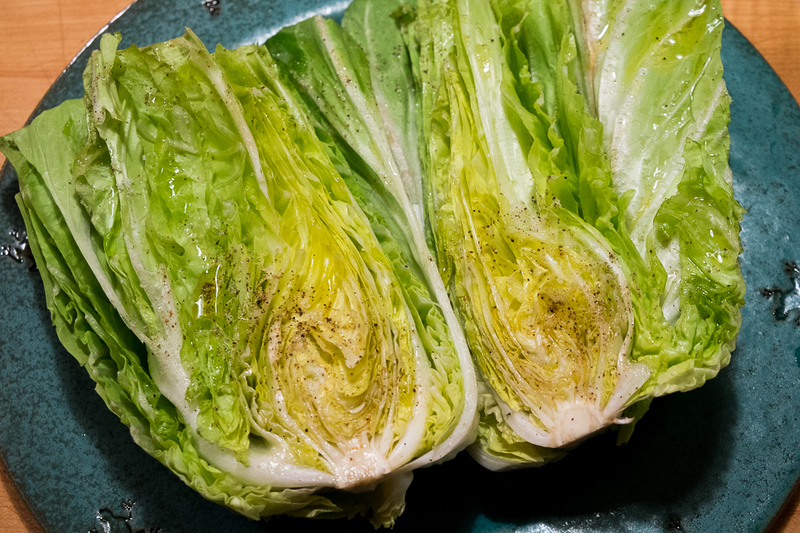 Pan di Zucchero means sugar loaf in Italian and sugarloaf is the name that English and American gardeners use for this chicory. In France gardeners call it pain de sucre. What these names are telling us is that of all the bitter greens, sugarloaf has a little more sweetness to go with its bitterness. It’s a slightly milder bitterness than its cousins offer, and like its cousins it’s delicious raw, braised or grilled. 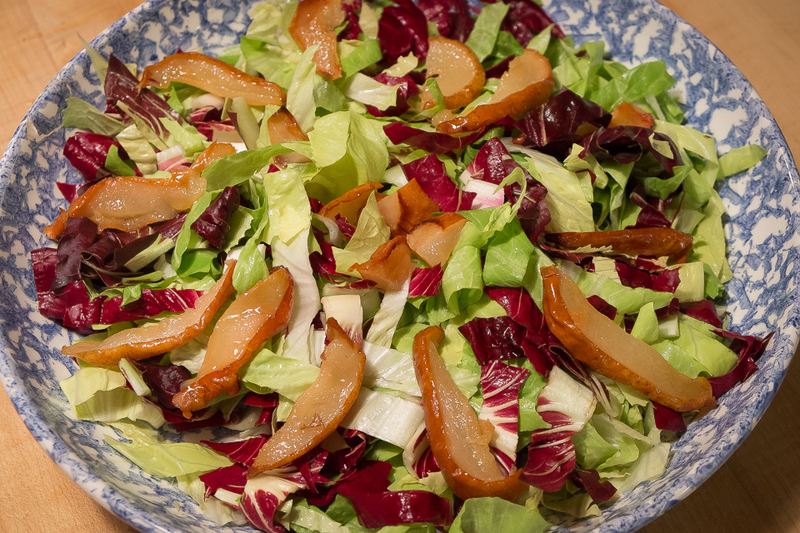 I’ve been using it raw in salads, alone or with pears, nuts and Gorgonzola cheese, with sherry or red wine vinaigrette. 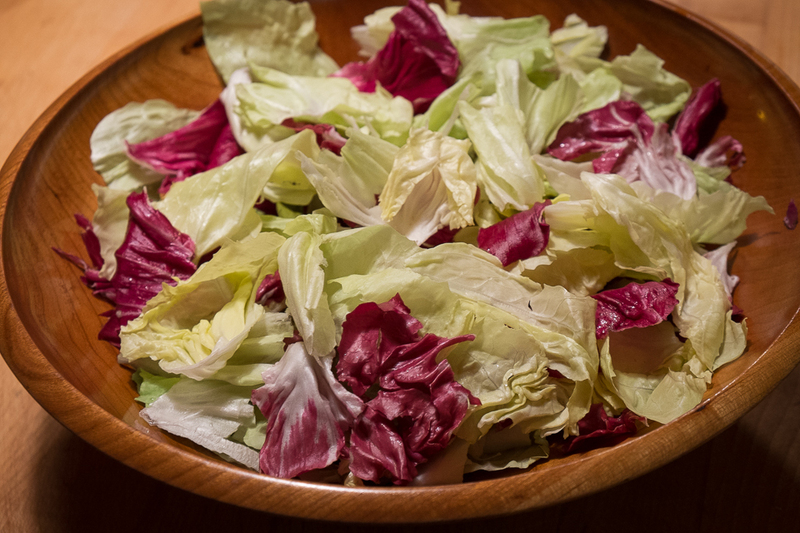 For a Christmas-themed salad, its light green leaves are lovely with the wine red leaves of radicchio. 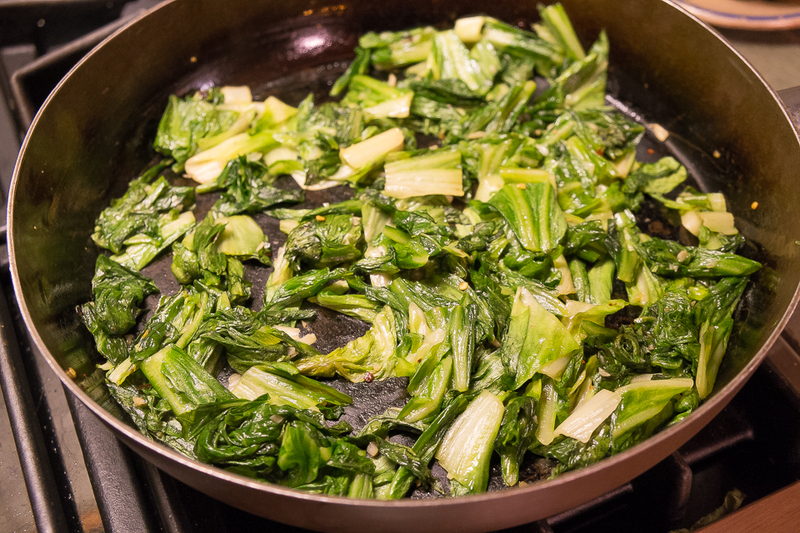 To cook it, I’ve braised the outer leaves in olive oil and garlic and served them as a side dish or as part of a pasta sauce. We’ve also sliced the heads in half, brushed them generously with olive oil, sprinkled with salt and ground black pepper and grilled them. 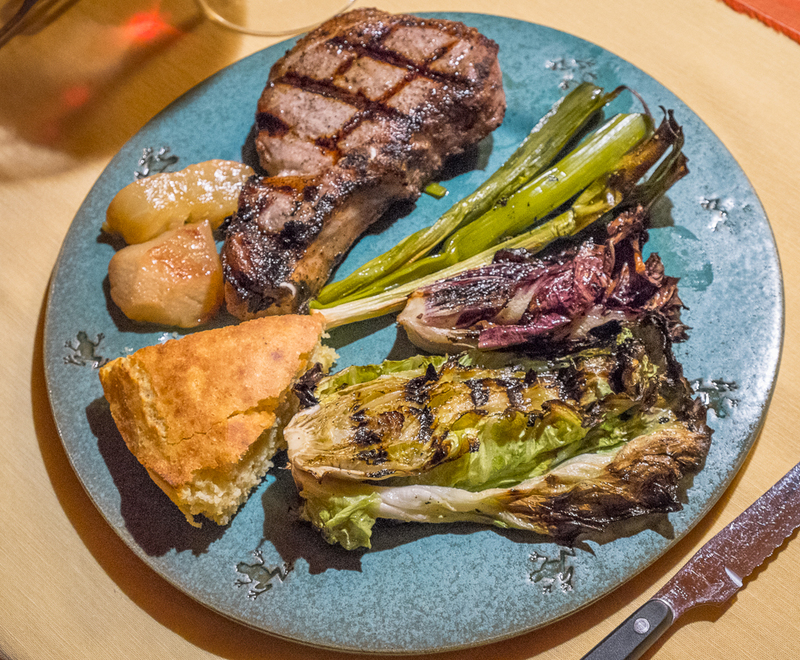 Braising and grilling bring out the sweetness even more and grilling adds a smoked flavor that reminds me once again that I need to grow a lot more sugarloaf chicory next year. 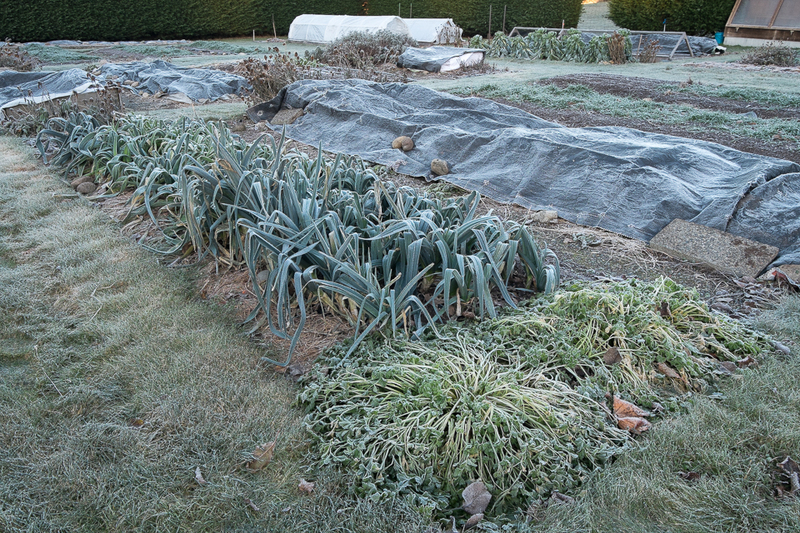 Cold weather in the kitchen garden always makes me anxious. Cold temperatures in early spring mean just planted seeds may rot or just germinated crops could die; summers that stay cold mean heat-loving plants will produce late if at all; and while fall and winter cold is welcome when it sweetens roots and hardy greens, really deep cold is not and the distance between welcome and not welcome is small. Low thirties to mid twenties are welcome; low twenties aren’t so welcome; teens are most unwelcome and single digits are the worst. I was traveling during the second week of November when the first cold spell of the season settled on the winter kitchen garden. From San Diego I watched the Lopez Island weather forecasts, trying to stay optimistic as each night’s temperatures dropped to the mid-twenties and lower. Before we left, I’d used more old hay to mulch the beds of winter roots, celeriac, parsnips, rutabaga, turnips, carrots and beets, closed the low plastic tunnels protecting the mulched rows of mustard, arugula, radicchio, added a bit more mulch to the hardier kale, chard and mache and decided the mulch already on those really hardy leeks and Brussels sprouts would do. Thirteen hundred miles to the south, I could do nothing but tell myself that that these preparations would protect the plants from damage and that they’d emerge sweeter from the cold. When I got home I found that the cold had been the unwelcome kind. Most plants would survive but it wasn’t pretty. The lush, green outer leaves of chard and kale I’d left a week before were black and rotting. So were the leaves of arugula and red mustard. Even the tops of the winter roots, the stalks of Brussels sprouts and the leaves of the leeks looked limp and battered. The only thing for it was to take knives and clippers to the greens, remove the rotting leaves and take heart from the healthy inner leaves that would continue to grow as the temperature warmed. And then I picked some Brussels sprouts, dug some roots, cut away bits of damage, roasted them and enjoyed their sweetness. And as November turns to December the cold is back. This time I’m home and I’ve spread more mulch on roots and covered it with tarps. I even covered the clumps of kale and chard with Reemay and tarps, hoping to protect the new growth. Each evening and morning I check the temperature. It’s always colder than the forecast predicts, my kitchen garden lying in a different microclimate than the weather station’s spot. Experience tells me that the plants will come through the cold and that when temperatures rise I can remove the tarps and find healthy plants. But I still worry. The only consolation is the sunshine that accompanies this kind of cold. It lifts my spirits made anxious by the cold and makes it easier to be optimistic about the winter kitchen garden gamble.